← How to export PDF to HTML? How to print webpage to bmp? In this article, I will show you how to print webpage to bmp and set paper size when you do the printing job after conversion. Install Document Converter on your PC. Document Converter is a software which can help you convert all the printable file to image file or PDF file. It has two virtual printers and one GUI version software. All of them can help you convert webpage to bmp but they have their own goodness. If you just need to do file format conversion GUI version software will be good for you. When you need to do the printing job after conversion, the two virtual printers will be much better. If you would like to have a free trial, please free download it by this link,http://www.verypdf.com/artprint/docprint_pro_setup.exe. If you need to know more about it, please go to its homage. 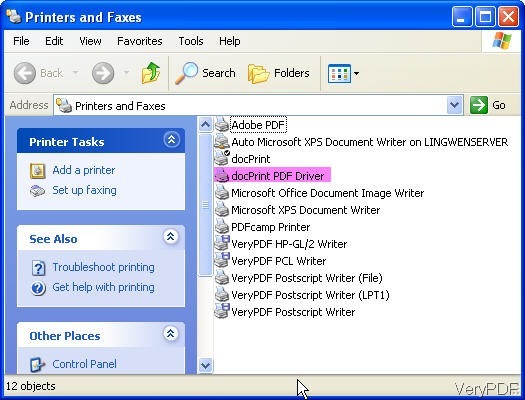 In this article, I will do the conversion by virtual printer-docPrint PDF Driver. When you install it successfully, the virtual printers will be listed in Printer and Fax menu option. The following snapshot can help you know more about this step. Open the webpage needed conversion, then open Print option in the browser. Print option can be opened by pressing “Ctrl+P” on the keyboard. Then you will enter Print menu option. Here you can set printing parameters, like printing copies or paper size. 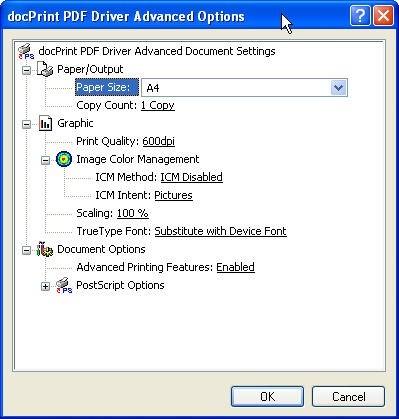 Take setting paper size for example, please set the docPrint PDF Driver as the printing driver first. There is a option named Properties tab on the interface. Click it then you can enter another menu tab. In the layout tab, there is a button name Advance. Please click it to enter another tab which looks like the following snap shot. Now you can find the option about paper size. When you set it, please click the button OK to end the setting part. Then the conversion from webpage to bmp will begin. The last step is to save and name the converted file in the bounced Save as dialogue box. Up to here, the conversion from webpage to bmp and set paper size have been done. If you have any question about this software and file format conversion, you are welcome to contact us by the ways stated on this website. How to convert OpenOffice documents of ODT to GIF? How to convert documents of HTML to FAX? How to convert MS Office PowerPoint documents of PPT to JBIG? This entry was posted in docPrint Pro and tagged webpage to bmp. Bookmark the permalink.